Security officer. Led an assault team that boarded the U.S.S. Enterprise on Lurin's order. Befuddled by Commander Riker's bogus computer lesson. 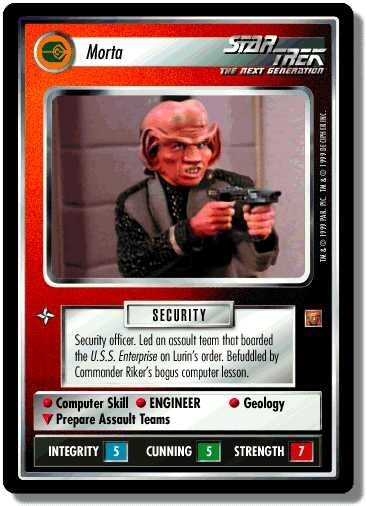 Characteristics: "Continuing Mission"-related cards, affiliation, "U.S.S. Enterprise"-related personnel, Ferengi species. Card logging info: Logged by openCards team at May 1st, 2009. No "reprints" for this card (no cards published with same title and game text in another expansion or with another collection info). To see all decks with this card click here. Create your own Deck in the ST1E deck section! There are 23 entries for Morta (ST1E 8 U 88) at the Tradeplace (56 haves and 2 wants). Click here to see all trade list entries for this Uncommon card! Also see here for all trade lists with any card fom "Rules of Acquisition".